Prior to the New York’s theatrical release of Todo lo demás / Everything Else, TropicalFront dialogued with Mexican filmmaker Natalia Almada, winner of the 2009 Sundance Documentary Directing Award and recipient of the McArthur “Genius” grant. 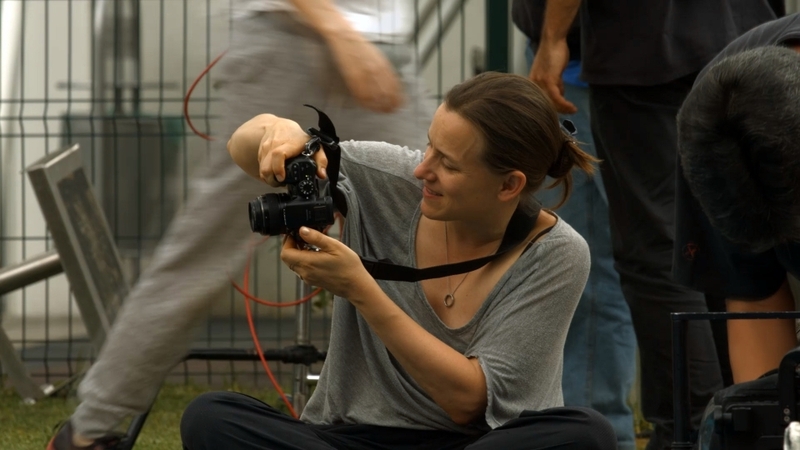 Her practices and ideas regarding her debut fiction film highlights her experience as a documentary filmmaker. The similarities between these two genres did not only surprised her, but also became a stimulating discovery that clearly deploys in Everything Else. What were the first challenges that you encountered making a fiction film like Everything Else? The most frightening thing was working with actors. But then, I was surprised when I lost this fear. In fact, the only professional actor I have worked with is Adriana Barraza, who’s incredible. But also, I was surprised how similar fiction and documentary are. For example, one of things I realized was that once you look through the camera, whatever the performance you see, it has to feel real. That is also true when you’re shooting a documentary. If you have a documentary character who’s somebody not sincere, who’s faking it, then it’s bad acting. It’s obvious. I don’t believe this person. They’re lying to me. Once I understood that, I looked for that kind of truth or sincerity. So then I felt much more confident, because I’d spent fifteen years looking at people through the camera in my documentary experience. So I had to think of Adriana almost as a documentary character and believe her. I did a lot of research about acting; and in my readings I found a very similar language between the ways people write about acting and about documentary filmmaking. Making a fiction film was a scary and overwhelming process (bigger production, more budget, more crew, and not much room for improvisation) but it was also surprising on how familiar it was. Then working with Adriana Barraza made this process easier for you. She was amazing. She has an acting school in Miami so she’s interested in the process of acting. She was incredible with the non-professional actors, like in the office scenes for example. She was leading them, but they didn’t realize it. They forgot about the crew and the set, because she was going into her character and they would follow her lead. She was the only one who read the script and we improvised most of the dialogues based on the script. But none of the non-professional actors had read the script. So the direction they mostly got was “you are you,” because I would cast people that were the kind of characters I wanted. Also, I gave them a situation: “you’re in a hurry to get back to work.” So most of the dialogues were improvised but that was possible thanks to Adriana. In terms of writing the screenplay, what was different writing a fiction film? For my documentaries, for the most part the purpose of the writing has been to raise money. In my docs, I had an idea and started filming quickly, so the writing happened more in the editing. I also edit so I have more flexibility. For Everything Else, first I had to find a way to write that would be similar to the way I shoot my documentaries. So for example, I would think of my character “she’s in the shower this morning” and I would write and describe everything I could about that moment. What does it look like? What does it smell like? What is she thinking? These were sketches which I edited them together in order to find a structure for the story. So that’s very similar to a documentary process for me. I wanted to preserve an aspect of improvisation, which is what I love the most of making documentaries. And also I wanted to preserve an aspect of observation, watching somebody, witnessing their lives, in an effort to get inside of them. But the process of translating these sketches into a script was very hard for me. Because I had to follow the rules of putting in the script only things that were filmable. For example, if I wrote, Doña Flor puts on her stocking: that’s an action that can be three seconds in another film or two minutes in mine. I struggled to understand how to convey in script language a notion of time and duration. Everything Else deals with the notion of “bureaucratic violence,” and this violence, as any other form of violence, sooner or later, has an impact on human bodies. Did you have in mind ways to film bodies before shooting? Yes, I thought a lot about it. Actually, it was in the script. Besides, I think bodies of women in their 60s don’t tend to get attention. It’s challenging to depict a female body that is not sexualized, because that’s what we usually see. Since I’m trained as a photographer, I did a lot of photographing as a way to figure out a visual language; and I worked with Lorenzo Hagerman, who’s great and we looked at other references (photographers and painters). We talked a lot about how we can show these women, not only Doña Flor but also the women in the subway and in the pool. There is a particular attention to feet and legs. Was this something planned or something it just happened while shooting? I think it was a little bit subconscious. It was in the script, but not in the sense of “we are fascinated with Doña Flor’s feet.” There was a lot of detail about her shoes or her stockings for example. I love how the stockings she wears are so much of a generation and of a woman of a certain age or how specific her shoes are: kind of cheap, worn, old but repaired, practical. I think they represent who she is. Doña Flor develops an attention to her femininity throughout the film, for example when she uses her lipstick especially after she is confronted to other women. What were the importance of these scenes for the film? People have certain habits that they repeat, which allow us to understand something about who they are. I think we can say that about people in general, not only characters in movies. My thinking was that if you can highlight these habits they can give you a framework with which to understand that character. For example, that detail about the lipstick, my mother was like that. She put on lipstick all the time. The stocking were the same. They were gestures of a certain generation of women who used the stockings as armor without which they cannot go out into the world. In a way, these stockings represent a constrained person like Doña Flor. It highlights exactly that, I believe too. You can detect it through the repetition of these details. Repetitions were very important. Because it is a repetition that gives gestures a meaning. If she put on lipstick once, we wouldn’t think about it. A lot of the repetition is a way of building the story. It is the way I think about narrative and how to create tension.The way you move forward in the film is mostly based on repetition. The concern with bureacracy in your film reminded me of Tomás Gutiérrez Alea’s Muerte de un burócrata (1966). In a way it’s related, but it’s also quite different because Gutiérrez Alea’s attention is on the side of the customer or solicitant. What was your take on putting the camera on the bureaucrat’s side having in mind these other films that were made in the past? When we think about bureaucracy in general, we tend to think about our side of the desk. We are victims of bureaucracy. “I, the citizen, am the victim of the system.” But we don’t see the people who are the bureaucrats; and that’s by design. They’re just meant to represent the machine. When I think about bureaucracy I think of these people who have lost agency because they got caught in the machine. It’s a very tragic position. In my opinion, they are the real victims. They have been totally dehumanized. We can go further and think about different ways in which people in our society gets dehumanized. That becomes the real violence, because when this happens you cannot even think about what their basic rights may be because they’re no longer humans. I thought a lot about this with drug traffickers in Mexico. There is a language with which people refer to them: “monsters,” “horrible,” “let’s use the military to get rid of them.” They have been dehumanized. I’m not defending the violence of the narcos, but while we dehumanize them we cannot solve the problem. We have to see them as people in order to consider what their needs are. If we don’t think of them as people, how can we hold them accountable for their actions? It’s very similar thinking when you look at bureaucracy and bureaucrats. Doña Flor becomes dehumanized because of the system in which she works and none of us see her, so then she doesn’t see herself anymore. Most of the time we encounter Doña Flor inserted in a big urban environment, where she almost disappears. This mode of filming highlights her inner world. What other techniques did you use to expose her interiority on the screen? When we smell something or hear something, it penetrates us differently than something visual. It’s more visceral. So, for example, I think that sound in the film often creates a tone or a mood for her interior space. This is supported by a structure: there is a use of time that allows sound to do that. Often there is a long shot that maybe doesn’t have any action, nothing happens, but it allows the viewer to read the image at a face value and think about and feel the different layers of that image.